Take the Muckross Road to the National Park. Past Muckross Village on the left hand side. Adjacent to Muckross House & Gardens. Muckross Park Hotel & Spa is a 5 star hotel uniquely located in the heart of Killarey National Park close to the Lakes of Killarney. A hotel since 1795, and originally part of the Muckross Estate owned by the Herbert family, it has seen visitors as diverse as Michael Collins, the Liberator Daniel O’Connell and Queen Victoria. The hotel is 4 Km from Killarney town and is close to the Wild Atlantic Way, Ross Castle, Muckross House and Torc Waterfall. The hotel offers 70 deluxe and superior bedrooms including 10 suites all newly refurbished. Each bedroom has king size bed, WiFi, in room climate control, complimentary bottled water, Nespresso machine and 24 hour room service. 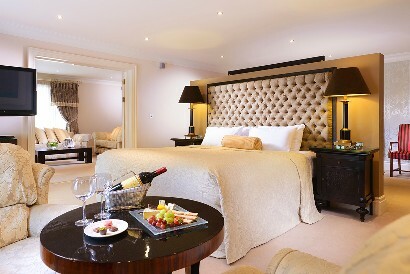 In 2006 the Blue Pool wing was built adding more bedrooms, a large conference suite and the renowned Spa at Muckross. The spa is the centre piece of the hotel with a vitality pool, full thermal area and 10 treatment rooms. Yew Tree Restaurant has won many accolades including a gold medal from Hotel & Catering, 2 AA Rosettes and Best Hotel Restaurant in Kerry. Situated in the traditional wing of the hotel, the restaurant offers a chamring classical atmosphere and intimate dining experience. Monk’s Lounge is the hotel’s main bar with a large selection of cocktails, gins and Irish whiskies. Afternoon tea and a tasty lounge menu are served daily. On the grounds of the hotel are The Reserve at Muckross, 18 luxury self-catering apartments plus Jarvey’s Rest Irish Pub which serves wonderful gastro pub style food. On selected evenings there is Irish music and dancing. All guests have free bike hire to explore the national park and adults have complimentary use of The Spa at Muckross.